When you start Microsoft CRM, the first thing you encounter is the Home Page. The Home Page is not only the first place you land, it’s the place you can always go back to if you find yourself confused in a sea of screens. Figure 1 shows a typical Home Page with its various sections. Figure 1: A typical Home Page. The panel to the left side of the main Home Page display includes two functions — Home and Settings. The first function, Home, brings you to the Home Page itself. If you are already positioned on the Home Page, selecting the Home option won’t buy you anything. The second function, Settings, enables you to perform a wide range of customizations. 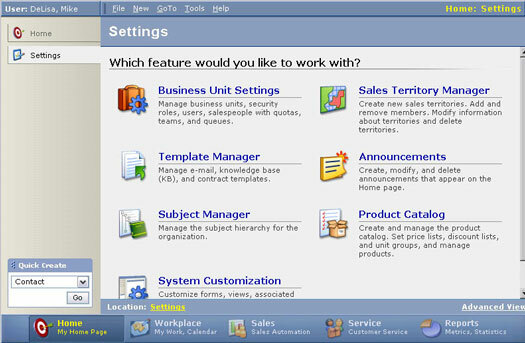 Business Unit Settings: Create Users and Teams and assign security. Template Manager: Create and manage templates for e-mail, Contracts, and the Knowledge Base. Subject Manager: Manage all the information in your Knowledge Base. Sales Territory Manager: Assign Team members to territories and manage those territories. Announcements: Create and edit internal announcements. Product Catalog: Maintain a Product Catalog that integrates with quoting and invoicing. Figure 2: Categories of settings. By default, your Home Page is set on the current date and displays past-due Activities, Activities you need to do today, and Activities scheduled for tomorrow. Each column can be separately sorted by clicking on its column heading. This sort functionality is really a toggle switch, enabling you to sort alternately in ascending or in descending order. You can check out your Activities for another date by clicking the Calendar button that is to the right of today’s date. Selecting the Calendar button causes a monthly calendar to pop up. To select a different date within the same calendar month, simply click (just once) on the desired date. You can select a completely different month by clicking on the right or left arrows within the calendar display. If you select a date other than today’s date, you no longer see Past Due or Tomorrow’s Activities. For any date other than today’s date, you only get to see that particular day’s action. Double-clicking on a date from the pop-up calendar immediately brings you to the first Activity scheduled for you for that day. The middle part of the Home Page is known as the Info View. The Info View contains the listing of your Activities, and toward the right side of the window is a series of icons that enable you to create new Activities quickly. 1. Click anywhere on the Appointment listing in the Info View. 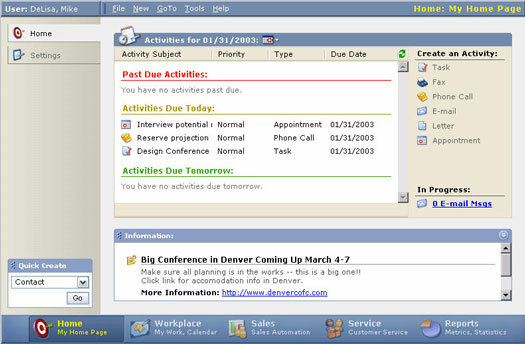 A window appears with the Appointment details. 2. Highlight and change any of the available fields. 3. Click the Save and Close button toward the upper left of the window. You return to the Home Page. 1. Under Create an Activity on the Home Page, click the appropriate icon for the Activity you want to create. A window appears, allowing you to enter the relevant information. 2. Enter all the necessary fields. If you create or modify an Activity and think it should be displayed in the Info View but you can’t find it, click the Refresh icon to the left of the Create an Activity section. The Info View is redisplayed with current data. Sometimes this trick works. At other times, it doesn’t appear to work, but the problem usually lies in the interface between the keyboard and the chair. The Announcements area of the Home Page is located in the lower third of the window. This is where members of your Team can post messages to everyone about companywide events or issues. For example, you might use this section to send a reminder about an upcoming price change or about a revised holiday schedule. Figure 3 illustrates a typical announcement posting, including a hyperlink to a Web site containing additional information. Figure 3: An announcement with a hyperlink. If an announcement is too long, or if several active announcements are showing, you can use the scroll bar at the right side of the window to review all the posted material. In the lower-right corner of the Announcements window is the Show All Announcements option. Selecting this option brings you to a full-screen window that more conveniently displays your announcements if you have more than a few. You return to your Home Page either by selecting that option from the Navigation Bar or by selecting the Back to the Home Page option in the lower-right corner. An announcement may contain a link to material posted on a Web site. If so, clicking the hyperlink within the Announcements window brings you directly to that posting. When you close that site, you are automatically returned to either your Home Page or to the Announcements display window. The Quick Create area enables you to easily create new Accounts, Contacts, Leads, or Opportunities. Business required and business recommended fields appear in virtually every kind of Record. The Quick Create function brings you to a window that enables you to enter just those specific fields that are required fields. Quick Create requires you to enter only two fields to set up an Account: in the case of Account creation, just the Account Name and the Owner fields. These required fields always have their field labels displayed in red. This limited set of fields is what makes Quick Create quick, but it behooves you to go back later and fill in as much information as possible. The Navigation Bar, shown in Figure 4, is the quickest and simplest way to get from the Home Page to any of the other modules. Figure 4: The Navigation Bar. Even if you go off to one of the other modules, the Navigation Bar is always available, and you can use it to get back to the Home Page at any time. For those people just getting involved with a CRM application or those coming from a simpler system, it’s sometimes too easy to get lost in what may seem to be a myriad of similar screens. The Home Page button on the Navigation Bar is always there for you, like a trail of breadcrumbs leading you home. Microsoft CRM does not automatically save data for you. You have to remember to click the Save button when you’re done entering information. So, even if you’re suddenly a little lost, remember to click Save before clicking the Home Page button.